Hi loves! Today I want to share a cute Valentine's Day nailart with you, and if you don't like Valentine's Day just consider it a girly fun look ;-). About 2 weeks ago I bought a fun glitter topper at H&M, called Pastel Dots. 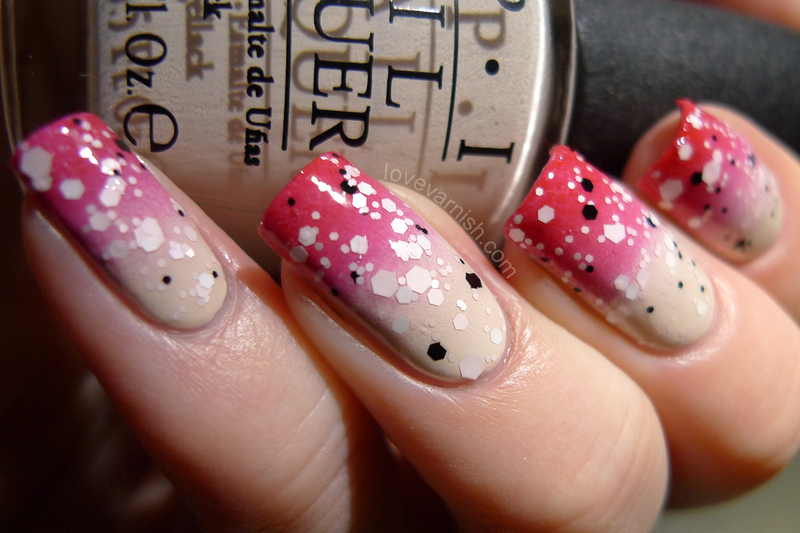 It's made up of white, soft pink and black hex glitter in various sizes. Unfortunately the pink is really soft so especially in pictures it looks white. To create this look, I started with a base of OPI My Vampire Is Buff, 2 coats. After it dried properly, I grabbed a little sponge and Essence Fame Fatal. I love the gradient came out hot pink in the middle instead of just beige to red! For gradients I always use the technique I learned from Sammy over at The Nailasaurus. This creates the softest gradients for me personally, but you could also paint the polish directly onto the sponge and work with that. After the gradient dried, I used the H&M Pastel Dots topper - toppers like these always look so fun against gradients! It applied well, the glitter didn't clump and laid down flat nicely. What do you think of this look? Something you'd wear for Valentine's Day or another occasion? Tell me in the comments! What a perfect gradient! The glitter really pops over the gradient base! I love Pastel Dots and I have to say that MVIB is hands down one of my favorite OPIs!! Great gradient!!! This is beautiful. I never really bother with Valentines but I'm sure I'd wear this during this year. It's perfect for summer too! Love the color combos. 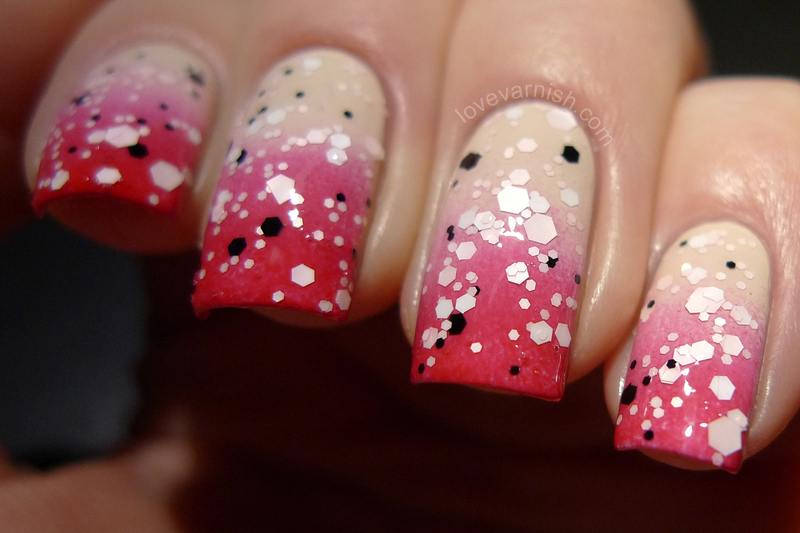 This is the perfect Valentines day mani. Amazing gradient! Perfect for Valentine's Day! The black and white glitter really pop against the gradient! I would definitely wear this for Valentines Day. I love the look of gradient polish and the top coat just adds a lil bit extra. Very pretty! So pretty! You did a great job creating this glitter accent. Very pretty polish! Gorgeous gradient too, and is it me, or does it make your nails look longer?! This is beautiful 7 I'm loving that topper- so light! What a beautiful gradient! I love that you went from neutral to bright and then the black/white topper! Perfect and beautiful!! That gradient is everything! This is so pretty! That glitter is really nice! It's a cute combo huh? Thanks girl :). MVIB is really one of my most used polishes EVER - it's actually visibly used lol, which almost never happens. Thanks! I liked how you could match it with V-Day but indeed it isn't limited to the holiday. Thanks Jessica! Adding a topper like that makes the look so much different :). Thank you so much Jennifer, glad you like it! It might be pulling a little trick indeed! Must be the lighter colored part at the bottom of the nail. Thanks Lisa! I'm quite happy with the gradient too :). Normally I'm a paint straight on the sponge type of girl but the last couple times I've used a damp sponge and that seems to give to give me a smoother gradient. I find I get those sponge bits if I over work the dabbing or I don't topcoat my base first.